“Respectfully, my comrade and friend Danny Haiphong is wrong, Hawaii congresswoman Tulsi Gabbard is not a peace candidate. To (the) extent that she diverges from the warlike bipartisan consensus that’s a good thing. But it’s not the job of the left to, in Danny’s’s words “nurture” or support Gabbard with campaign donations so she can get into the televised Democratic primary debates. Now I wish Bruce had given other reasons that Tulsi’s not a true ‘peace candidate’, but that’s just me. “The Hawkins vision includes a yearlong grassroots organizing campaign to overcome the profoundly unjust legal barriers which Republican and Democratic politicians together have erected in almost half the states to prevent the Greens from competing against them in national and local elections. Unlike the regulations pertaining to Republicans and Democrats, these arbitrary, anti-democratic and unjust laws require Green Party candidates to present more than 800,000 voter signatures on paper petitions just to allow Green candidates for local, state and national office to appear on the ballot in about a third of the states. 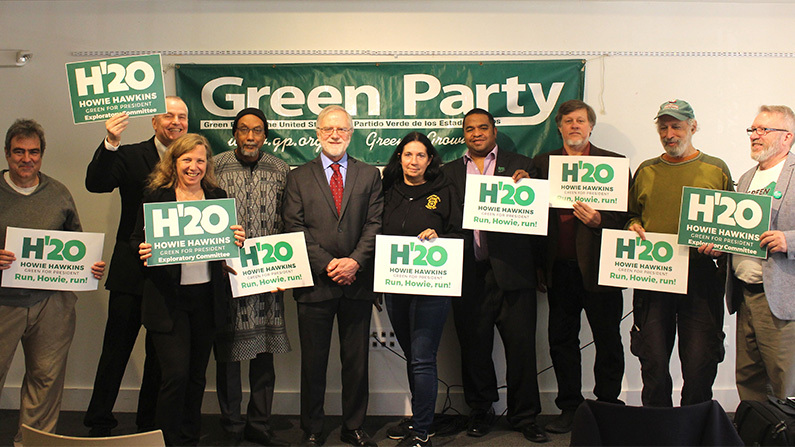 “Howie Hawkins is 2020’s only real peace candidate because Howie is committed to the hard work of building a permanent peace and justice party from the bottom up, and putting it on the ballot nationwide, not just to running a one-shot sheepdog campaign and lining up behind whoever the capitalist war party eventually nominates. Howie has been in the movement longer than Gabbard has been alive, working against the Vietnam war as a teenager before joining the Marines in 1972 and taking part in the widespread antiwar movement inside the US military of that time.”, and so on. He advises readers to go to HowieHawkins.us to contribute to his exploratory committee; this is his ‘About Howie’ page, ‘Testing the Waters’ is here. “There are only 2 pieces of HR 1 which are NOT empty 2020 campaign promises, and which have a reasonable change of becoming law. Really, really BAD law. 1.HR 1 Requires that the “intelligence community” produce a yearly report on threats to the US electoral system. Wondering by now how many Greens have thrown their hats into the Presidential Ring, I let my fingers do the Binging once again, and found at Wikipedia: 4 candidates have declared: Ian Schlackman, Long Island; Dario Hunter, Ohio; Howie Hawkins, New York; Sedinam Kinamo Christin Moyowasifza-Curry, Los Angeles. Potential candidate: Jesse Ventura, Minesota. Declined to run: Bernie Sanders and Jill Stein. ‘The 2020 Green Party presidential primaries will be a series of primaries, caucuses and state conventions in which voters elect delegates to represent a candidate for the Green Party’s nominee for President of the United States at the 2020 Green National Convention. The primaries, to be held in numerous states on various dates from early Spring into early Summer of 2020, will feature elections publicly funded, concurrent with the Democratic and Republican primaries, and elections privately funded by the Green Party, to be held non-concurrently with the major party primaries. Got that? Hope so…hope I catch on soon. Our tax dollars should be used for programs of social uplift, not subsidies for those who are already wealthy. @HowieHawkins recognizes we have to change the system to solve the crises we face. Money (including the federal reserve), Big Banks, Power Utilities, Big Pharma, Broadband. Arms Industry, Racial Justice, Peace Process, Agriculture, Immigration Reform…a long list with some specifics. Goodness! How rare these socialists are, comrade! yes, one running on the green party ticket certainly is, comrade snotty.